~Steve Maraboli, "Life, The Truth, and Being Free"
right, I'll do it myself". In his book, The Right Stuff, Tom Wolfe writes about U.S. Air Force pilots who were experimenting flying at the highest altitudes ever attempted. At about 80,000 feet, the planes would begin tumbling end over end. The pilots frantically attempted corrections to stabilize the planes without success, and lost their lives. Chuck Yeager was one of the pilots in this experiment, and when he reached this high altitude, luckily he lost consciousness. His hands were off the controls, and the plane stabilized itself. When the plane reached about 30,000 feet, he regained consciousness and was able to land the plane successfully. Sometimes it's in our best interests to let go of the controls. It's okay to take a breath, close our eyes, and just be with whatever happens. I have been working to incorporate this "hands-off" approach into my life, and I must say, it's very freeing. Instead of always leaping in to control something, try closing your eyes, taking a few deep breaths, and just going with the situation. 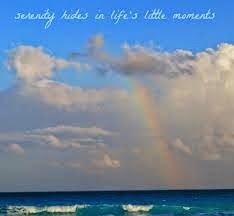 Sometimes a better response will come to you in your moment of serenity.